The Kori Oxfords (here, here, and here) are a staple shoe released by Alexander Wang every year which is why it's taken me this long to purchase them (I have always liked them but figured I could get them anytime). Of course, it seems to be the rule that only when you do decide to "pull the trigger" on an item does it suddenly become impossible to find them anywhere! The past few months have consisted of me desperately trying to hunt down these shoes in my size locally, online, and even on my Seattle trip but to no avail. 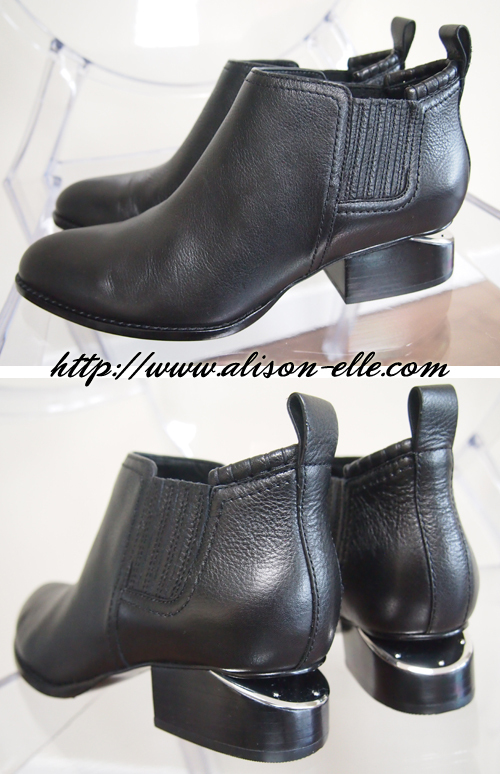 Happy to say they are now finally in my possession... these boots could not be more "Alison." A while ago, I was contacted by OMG Nail Strips to see if I wanted to try out some of their nail strips and since then have been waiting for the perfect time to use this fun Rain Storm design. Living in "Raincouver" I knew it wouldn't be too long so when the Pineapple Express storm hit the west coast over the weekend, it was nail art time! The nail strips come in two designs (as seen above with AVON Gel Finish Polish in Royal Vendetta on my index finger and pinky) and were incredibly easy to apply (see instruction video). The quality on these was spectacular. There were no jagged edges when filing off the excess and they adhered to my nails well with no bubbling. I did find the strips to be larger than normal but I guess that's good because there will be a greater likelihood of fitting more nails, plus you can always trim them down to size. At $7.99 for 14 strips, they are not exactly cheap but if you use them as accent nails you can really make the pack last. 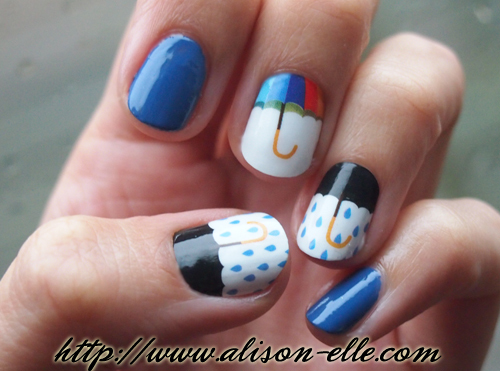 Besides, the umbrella design is so cute and I've gotten tons of compliments on my nails already. While the umbrella design could probably be freehanded with some time and patience, getting a mani like this done so quickly is well worth it. 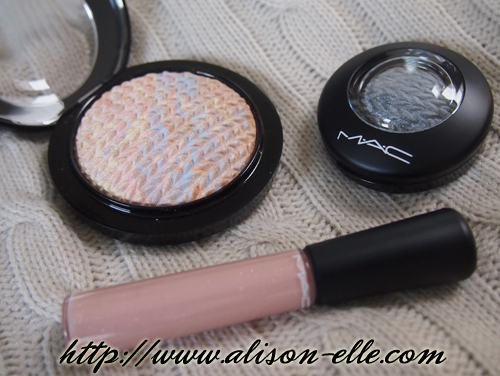 An interesting take on a winter collection, MAC Cosmetics Lightness of Being is full of cool and frosty pastels that drew me in the second I saw the promo pictures. It certainly helps that most of the products also feature the brand's Mineralize formula which I absolutely love (see my review of the Mineralize Rich Lipsticks). So, inspired by a few products I was sent from the collection, I thought I'd put together a light and airy makeup look. On my eyes, I am wearing MAC Mineralize Eyeshadow in Uninhibited, a shimmery light grey that is divided in the pan (half pearl/half frost). To add some definition, some simple cat eye liner was next. If you're looking for a jet black eyeliner that's easy to use and has excellent staying power, I highly recommend Make Up For Ever Graphic Liner in Vinyl Black, one of MUFE's newest liner releases. 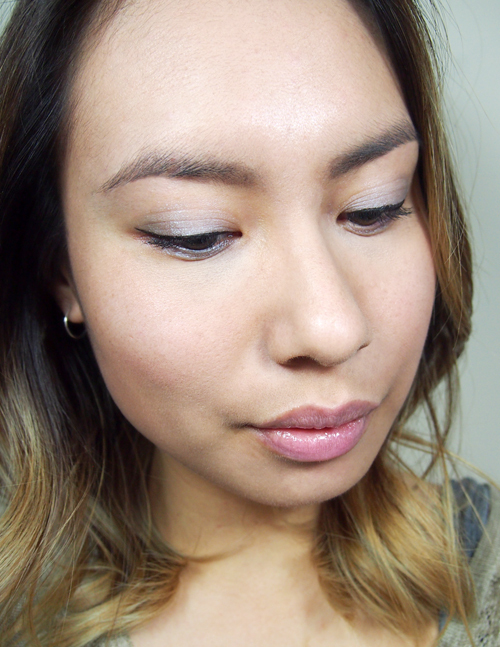 On my cheeks, I am wearing MAC Mineralize Skinfinish in Lightscapade which has been a longtime MAC fan fave. This version features the shimmery pale peach with lavender marble that Lightscapade is known for but also comes in a limited edition embossed knit pattern. For an additional touch of light colour, I applied Lise Watier Blush Creme Satin in Rose Eden on the apples of my cheeks. On my lips, I am wearing MAC Lipstick in Creme Cup (not from the Lightness of Being Collection but a great light pink if you're in need of one). Topping that, I applied MAC Mineralize Lipglass in Poetic, which is a very sheer champagne pink with a pearlescent finish. 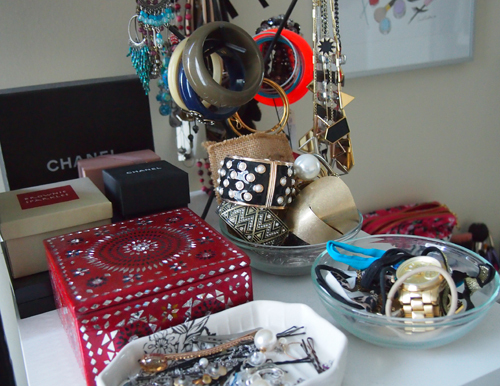 For a full list of products I'm wearing, check out my post on this week's FASHION Magazine Beauty Panel! 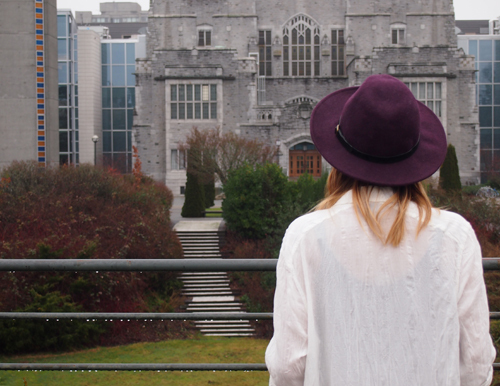 It's hard to believe that I moved to Vancouver a little over 10 years ago (seriously, that seems like forever) to attend university... in a completely new city... on the other side of the country. At the time, I never intended on staying past my undergrad but life has a funny way of working out. Two degrees and a career later, I really can't imagine living anywhere else. 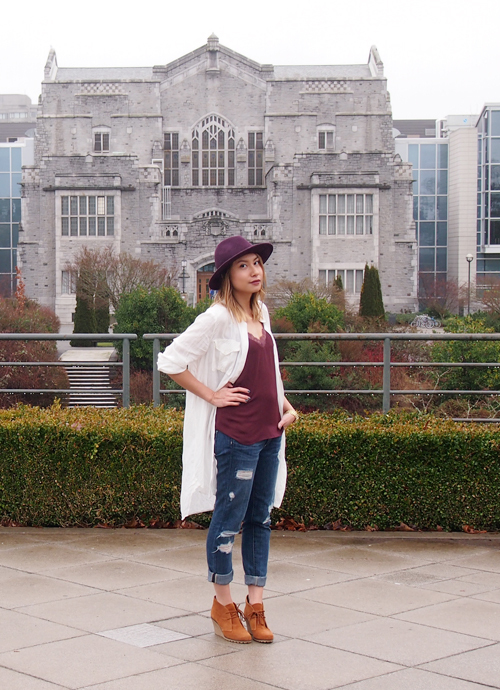 It's only fitting then that a visit back to my alma mater was in order; after all, I have to thank UBC for laying the foundations that turned me into the west coast girl I am today. Inspired by her meetings with a modern-day geisha, TATCHA founder Victoria Tsai set about creating a skincare line rooted in ancient Japanese beauty rituals and the philosophy that less is more. I first heard about the brand's famous Aburatorigami Beauty Papers (oil-blotting papers) a few years ago and have been dying to try some of their other skincare products since. After completing an online personal skin consultation questionnaire, the company sent over their Ritual Discovery Kit for Oily Skin. Packaged in a gorgeous box with mini jars and bottles that are also perfect for travelling, the kit acts as a two week introduction to their 4-step skincare routine. The first step in the routine is to pump a quarter-sized amount of the One Step Camellia Cleansing Oil into dry hands and massage it onto a dry face. The cleansing oil will get milky when you rinse it off with warm water. I know I have mentioned before that I don't love cleansing oil since my skin never feels fully "clean" after use but I do actually find that this one works well for face makeup. 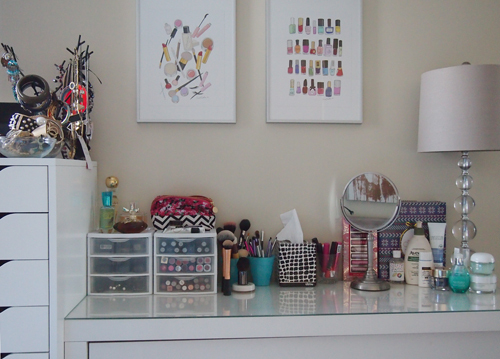 I do, however, use a makeup remover first to get off stubborn/waterproof eye makeup. Next, you use the Deep Rice Enzyme Powder to polish your skin. I've never used this type of exfoliator before so I was initially a little apprehensive. You tip out about 1/2 teaspoon of powder into wet hands and rub them together to turn the dry powder into a creamy consistency before massaging onto the face and rinsing away. It's very gentle and this particular formulation contains Dokudami, an antibacterial botanical extract intended to combat acne. 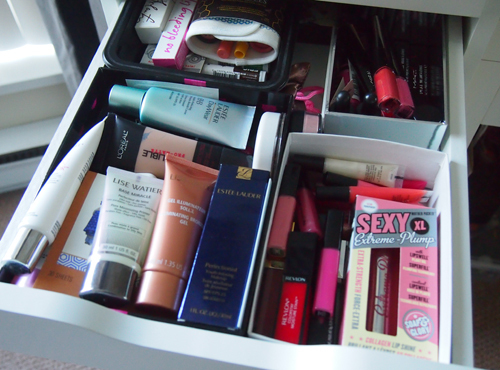 The only thing is that it can get a little messy if you're not careful since the powder is loose. Step three involves applying the Deep Brightening Serum, made with licorice root to target hyperpigmentation while hydrating. On top of this you layer the Moisture Rich Silk Cream, which is a lightweight gel moisturizer. Overall, this kit has been the perfect introduction to TATCHA. I can see why people rave about this brand... the products all feel incredibly luxe yet with a refined simplicity that speaks to the core of Victoria's inspiration. 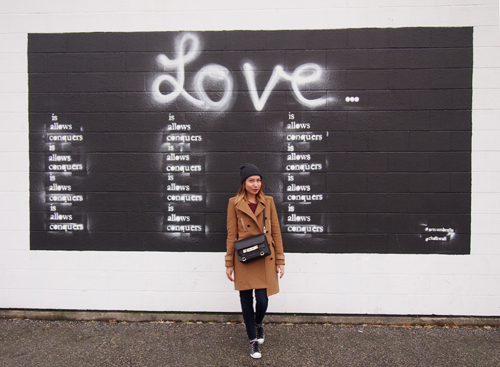 I couldn't think of a better backdrop for my first outfit post of 2015... after all, this year I want nothing more than to love and surround myself with love. One of my favourite ways to de-stress is to run a bubble bath, light some candles, and slather on a face mask. Since I've been having a lot of these nights in these past few months, I thought I'd share a few of of the masks I'm currently loving! I purchased the Aha Mask after my last facial at Skoah since they always use it on me during treatments and I wanted a jar of my own to integrate into my at-home skincare routine. The product is clear and feels like jelly to the touch, containing alpha hydroxy acid to naturally exfoliate without any harsh scrubby beads. It is also infused with peppermint which results in a fun tingly sensation while on and smells very nice and fresh. 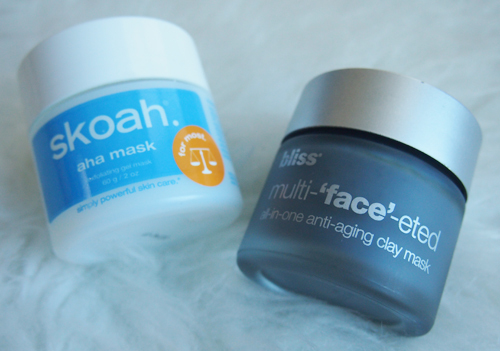 I was also sent the Bliss Multi-'Face'-eted All-In-One Anti-Aging Clay Mask (that's a mouthful!) a little while ago. I have always liked Bliss products and this mask definitely takes the title of nicest clay mask I've ever used. You know how some clay masks can be kind of chunky and drying? Well, not this one. The texture is buttery smooth, and it stays moist so your face doesn't feel uncomfortable as the mask "shrinks". I haven't been using it long enough to determine the extent of its anti-aging effects but my skin does look noticeably brighter after use, probably thanks to the 10% glycolic acid (one of my favourite skincare ingredients, though it can be harsh for those with sensitive skin). Happy 2015! 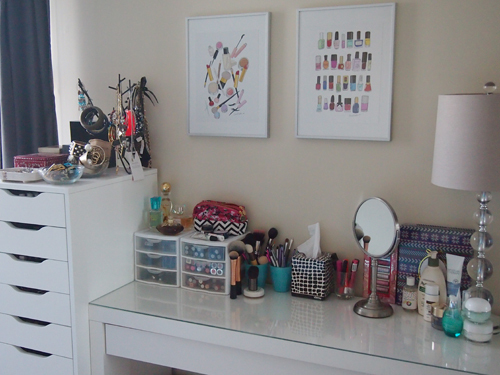 To start off the new year, I wanted to share something that I've been meaning to blog about for ages: my vanity area. 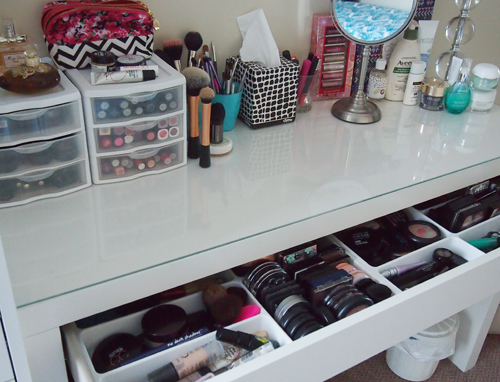 I'm really happy with my current set-up (the IKEA Malm Vanity and Alex 9-Drawers), and I thought this might be helpful in case any of you are looking for ideas on how to organize and store your makeup. I initially tried to do this in photo and text form but I found it was way easier to film a video explaining everything. That means this post also marks my first foray into Youtube! Disclaimer: I have absolutely no idea how to make videos, having never done one before, so apologies for the terrible quality and extreme shakiness. Apparently I have no idea how to hold a camera straight, haha. To make up for my severe lack of video editing skills, I'm also including some photos. 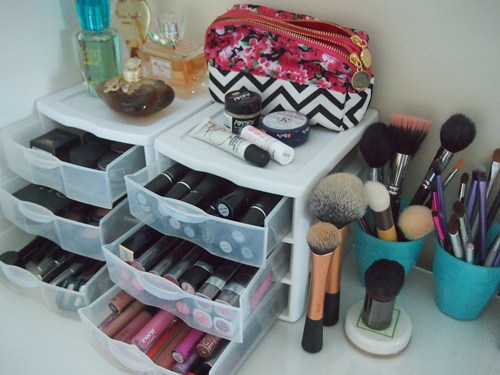 You'll see that I use a variety of different storage/organization solutions, from plastic 3-drawer sets to cutlery trays and reused beauty boxes.